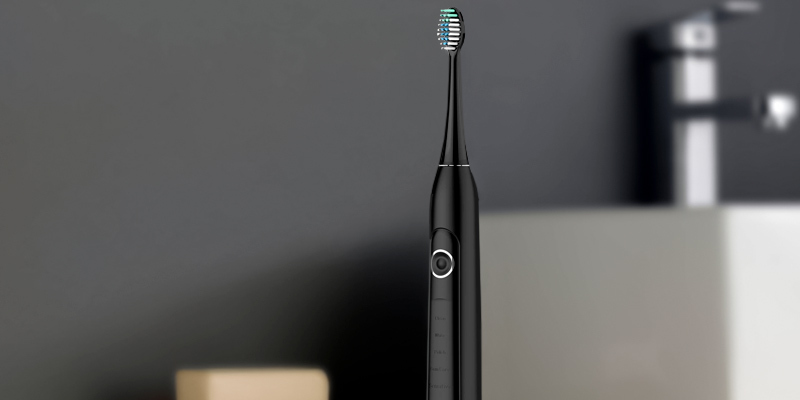 The toothbrush boasts an innovative charging method - True Wireless Charging. You simply need to set the brush back on its stand, and the wireless charging will begin. Some users claim that it's a bit too noisy. 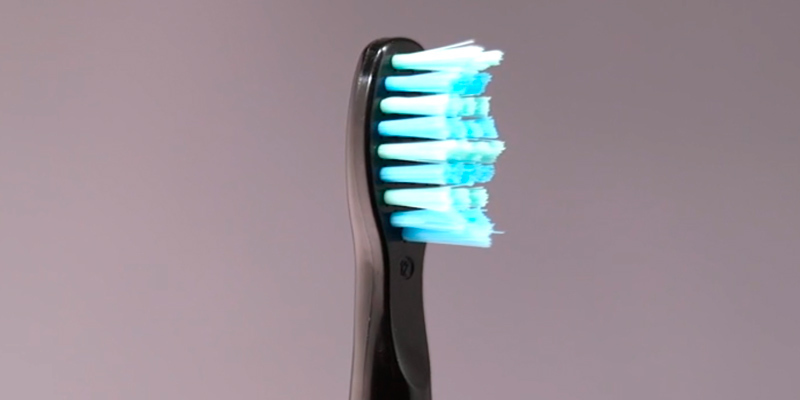 The AquaSonic is a super-powerful toothbrush that can brighten even heavily-stained teeth. Plus, it's great for travel purposes since it comes with a hard-shell travel case. The package includes 4 brush heads - 1 Inter-dental brush head for braces and 3 brush heads with a "W"-shape design for teeth. Even in the most gentle mode, it might be a bit rough on overly sensitive teeth. The Fairywill 508 is a good match for those who value style and functionality. 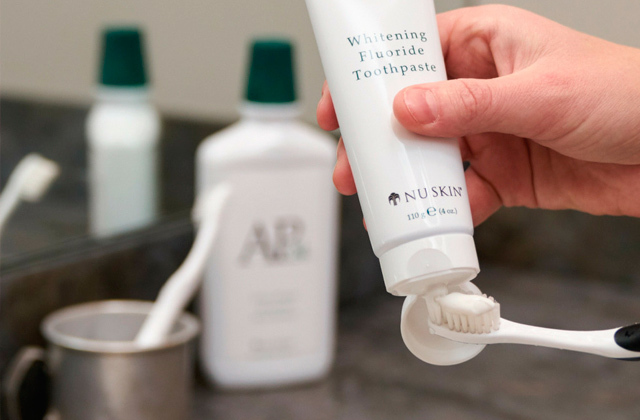 It's powerful enough to deep-clean your teeth and attractive enough to suit your taste. The brush boasts over-charge protection, short circuit protection, surge protection, and over-heating protection. One of the safest models out there. The settings aren't saved in the memory. You should switch to the needed mode with each use. Though the Liberex MS100 toothbrush costs just a fraction of other big names, it has quite a lot to offer. It's super quick, super versatile, and super safe. The DuPont toothbrush head is made of ultra-soft nylon. So, the brush can be safely used on braces, orthodontics, implants, and veneers. It's better to use this brush on sensitive mode to get used to the feeling within the first week or two. 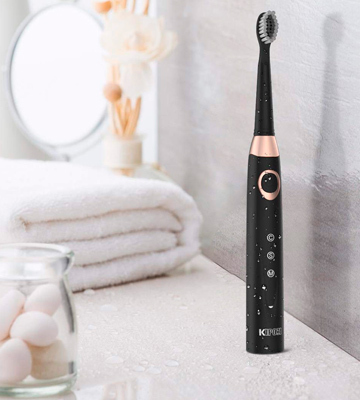 The KIPOZI toothbrush is a great option to accustom yourself and your family to ultrasonic technology. It delivers a very gentle cleaning and is suitable for adults and kids alike. 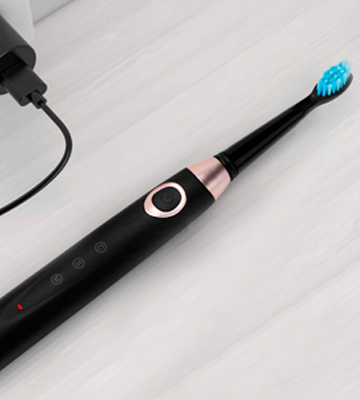 The toothbrush will automatically stop charging once fully charged. No worries about overcharging. 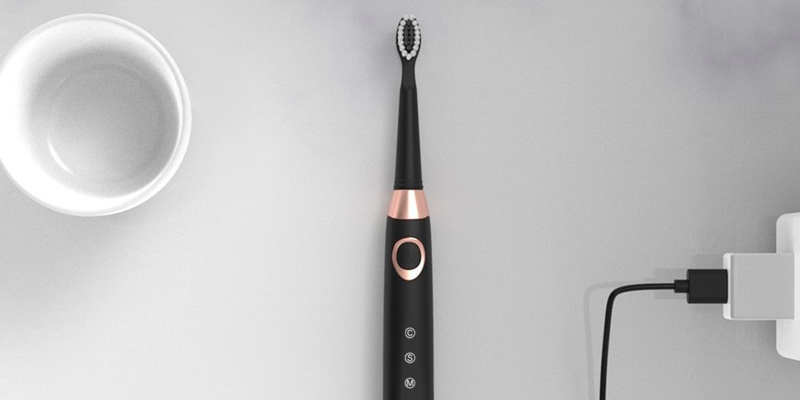 This sleek-looking toothbrush offers basic cleaning options and a flexible way of charging. It can become a good travel replacement for your advanced home brush. This is really one of the best ultrasonic toothbrushes out there. 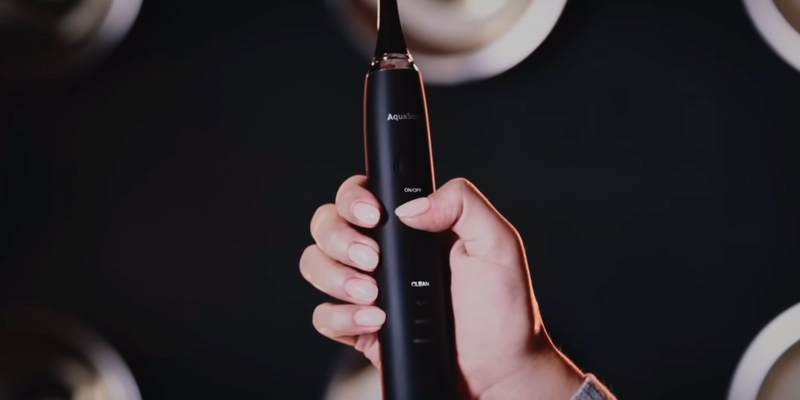 While many other sonic toothbrushes just aren't up to the task of brightening heavily-stained teeth, the AquaSonic can handle this problem. 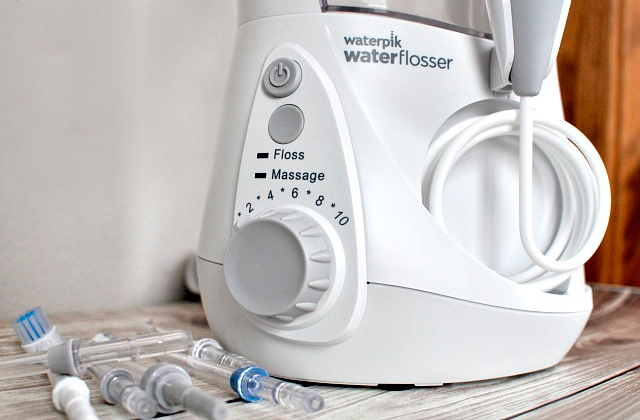 Featuring an industry-leading motor, it produces 40,000 vibrations per minute to deliver a deep and thorough cleaning of your teeth. 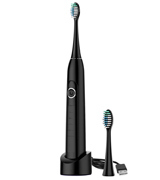 As a result, the AquaSonic toothbrush removes 3x more plaque than simple electric toothbrushes. Plus, in the whitening mode, the brush uses inverted frequencies to dissolve even tough surface stains from coffee, wine, tea, etc. 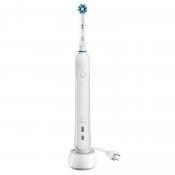 Besides the basic cleaning and whitening modes, the brush offers soft mode and massage mode. The soft mode is good for people with more sensitive teeth and gums, while the massage mode works well for everyone who wants to keep their gums healthy. The AquaSonic has one more terrific feature to make your teeth cleaning routine more effective and enjoyable. It has a smart vibrating notification timer that alerts you each 30 seconds to switch to the other oral cavity area. As for aesthetics, the brush boasts a sleek and ergonomic black satin handle that is rubberized for a better grip. It looks both elegant and valuable. 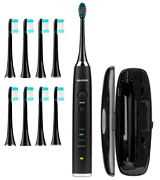 This high-powered toothbrush is packed not only with the most up-to-date technology but with 8 additional brush heads as well. The brush heads are manufactured by DuPont, an American and world leader in "quality & materials science". Each head lasts for approximately 4 months, meaning you can save much money in the long run. You won't need any replacements for over 2 years! 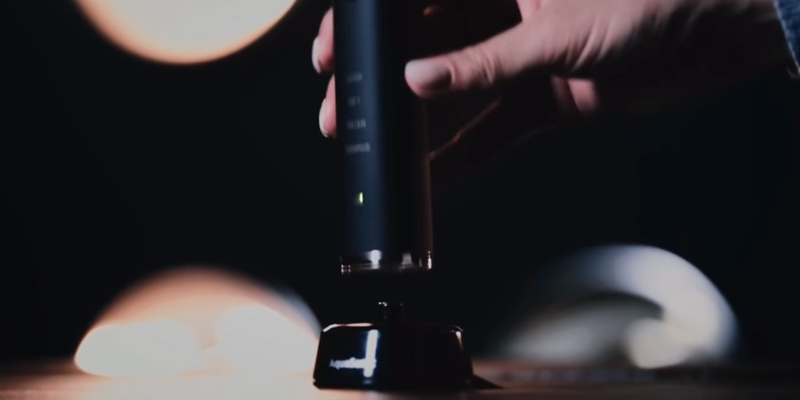 Aside from brush heads, the kit includes a sophisticated charging stand. Simply set the toothbrush on the stand for fast wireless charging. 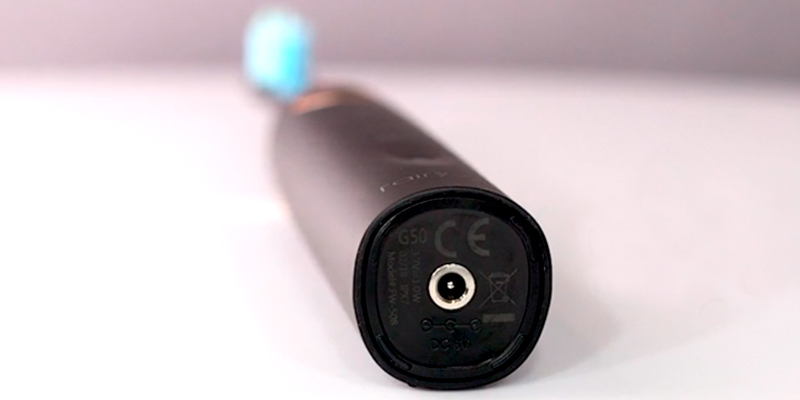 Once the Aquasonic is fully charged, you can remove it and take it on-the-go with the included case. The convenient hard-shell travel case has room for a brush and two additional brush heads. 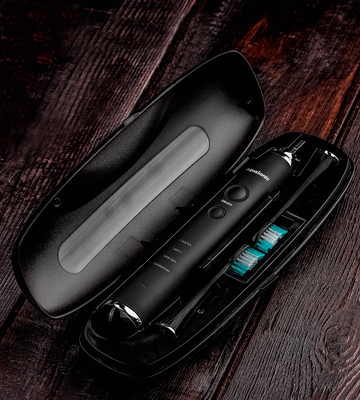 So, if you need a professional world-class toothbrush that can also work well for travel purposes, the AquaSonic is the best pick. 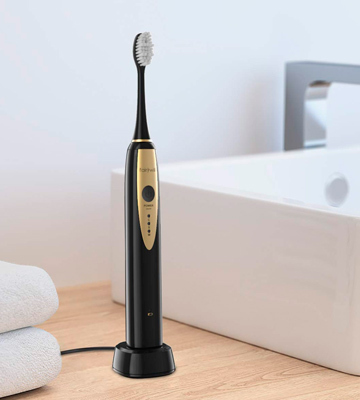 Even if you're searching for a budget-friendly toothbrush and don't expect too much from a model that costs less than $25, we bet you'll be surprised by the good quality and performance the Fairywill FW508 offers. It's not a cheap pseudo-sonic model but a true powerhouse-in-your-mouth. Delivering up to 40,000 sonic vibrations per minute, it is able to improve your oral health in just 7-14 days of regular use. Another thing that may encourage you to buy this toothbrush is the generous set of extra heads it comes with. 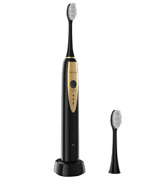 The brush is supplied with 4 brush heads, three of which boast a "W" shape design. 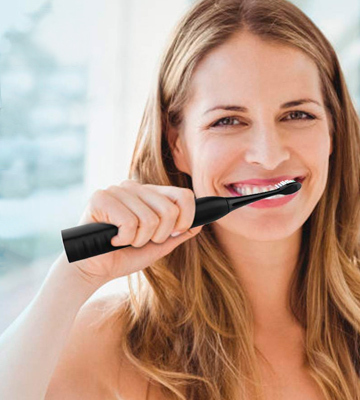 Therefore, the brush perfectly suits the topography of your teeth and reaches every part of your mouth. Additionally, the length of the brush handle gives good reach to the back teeth. We consider the bristles as the happy medium between soft and firm, but take note though, they might be rough on very sensitive gums and teeth. In this case, you might get some benefit from the Inter-dental brush head (also included in the set). 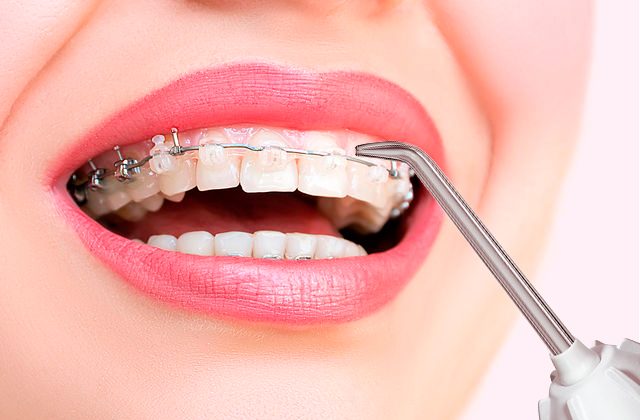 It's gently soft and intended for cleaning hard-to-reach areas like in-between teeth and orthodontic braces. 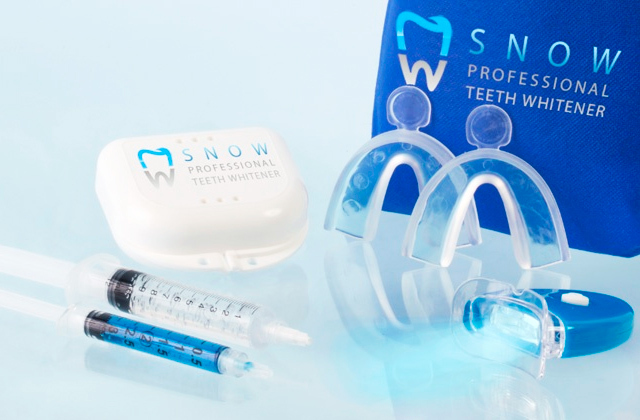 It's a pretty nice addition that can bring teeth cleaning to a whole new level. What sets this brush apart from most other similar models in its price range is its smart design. The handle has nice, luxurious golden accents that make it very expensive-looking and aesthetically pleasing. Plus, the brush is available in a pink casing to suit your bathroom interior or personal preferences. That said, the pink casing is usually available in the top series only, which really emphasizes that this model is high quality. Other benefits include a waterproof design and easy charging. 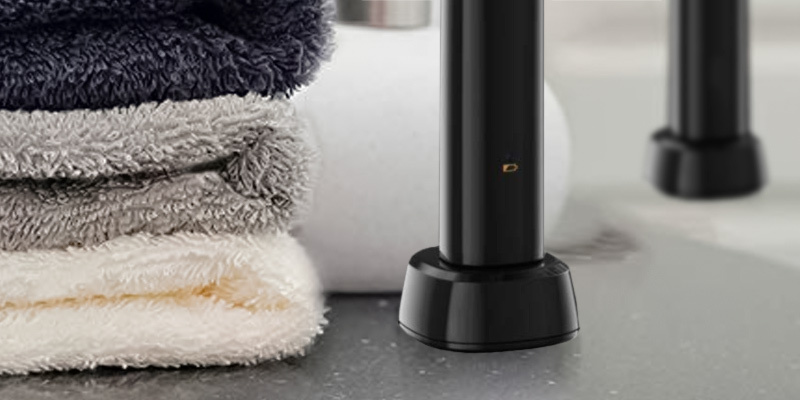 The casing is IPX7 rated, meaning you can enjoy brushing while you're taking shower or having a bath. The water won't be able to get inside the small USB port (at the bottom) and damage your toothbrush. By the way, the brush requires just a mini USB cable to juice up. 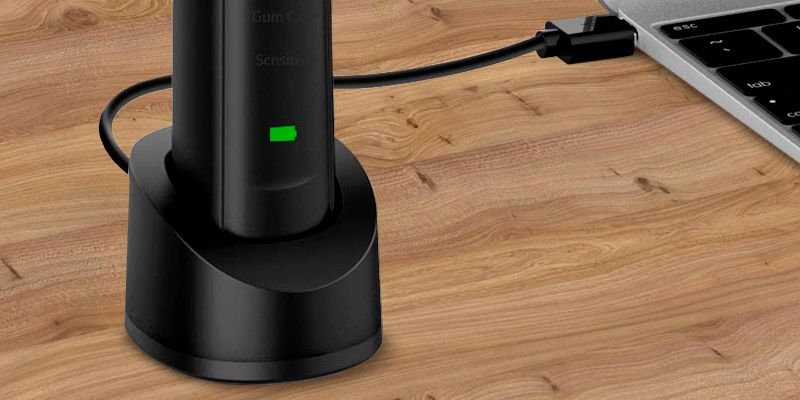 No longer will you need to take a bulky charging base or charging glass for re-charging. The portable and attractive design along with excellent cleaning properties make the Fairywill 508 a good match for those who value both style and functionality. Still hesitant about whether ultrasonic technology suits you and don't want to shell out tons of money just to find out? Try the Liberex Sonic Electric Toothbrush! It matches up really well (if not better) with top-quality brushes from other big names, yet it's almost half the price. It looks premium, stoutly-built, and offers lots of extra features. 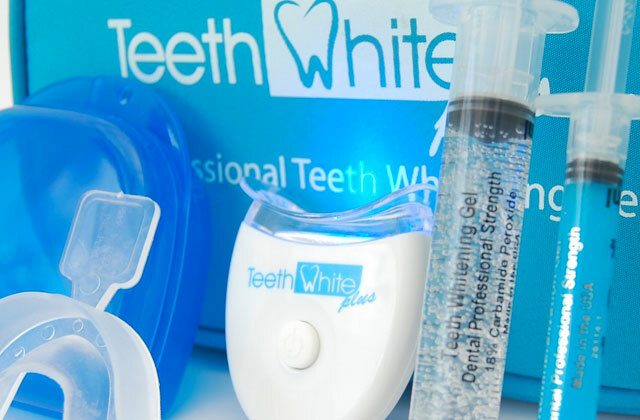 Whitening mode can make your teeth much whiter if used several times a week. 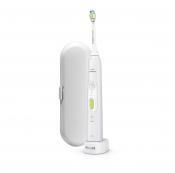 The Liberex MS100 Sonic Electric Toothbrush has a quite smart design. It utilizes USB inductive charging technology that adds to the safety and convenience of use. The brush is compatible with most phone chargers, so even if you happen to lose the original one, finding a replacement will be quite easy. Another thing that adds to usability is the battery level indicator. It blinks red when the power is too low and turns green once the battery is fully charged. By the way, one full charge will be enough for 1 month of regular use. 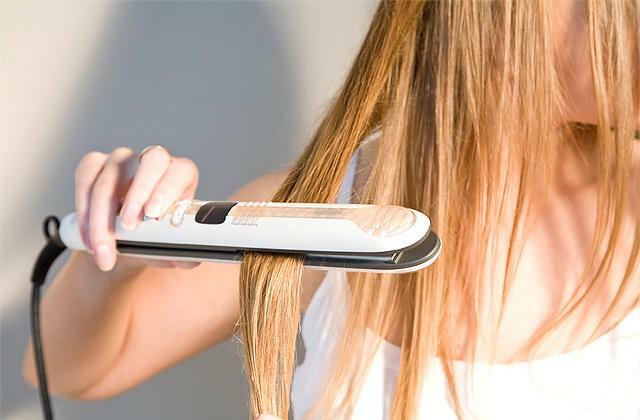 For extra safety, the brush will auto shut-off once it's fully charged. Besides over-charge protection, the brush can boast of short circuit protection, surge protection, and over-heating protection. So, if the safety, high performance, and low price are the things you cherish the most, the Liberex MS100 is a solid fit. Want to try ultrasonic technology but don't know where to start? 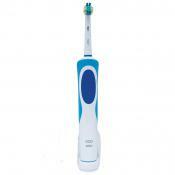 The KIPOZI Sonic Electric Toothbrush is a great option to accustom yourself to sonic technology. It's agile, small, and soft enough to become a great entry-level model for both adults and kids. The brush boasts an innovative DuPont toothbrush head which can easily get into all hard-to-reach areas and clean in the gaps between the teeth. The great advantage is, it can safely be used on braces, orthodontics, implants, and veneers. Take note, however, if you're new to ultrasonic technology, you might experience a weird tickling/tingling sensation at first. So, it's better to use this brush on sensitive mode to get used to the feeling within a week or two. As far as the brush head design is concerned, it's a great size for tiny mouths, which makes it well suitable for 3+ year old kids. Of course, small kids should be supervised by a parent or an adult, but the fact that it's suitable for even a toddler speaks a lot about its gentle cleaning properties. The soft bristles will prevent abrasion to the teeth, enamel, and gums, making your teeth feel silky smooth. The brush is delivered in a beautiful box with a total of three additional brush heads, a protective bristle cover, a soft pic, and a charger cord. Plus, each item is neatly wrapped in the box separately. 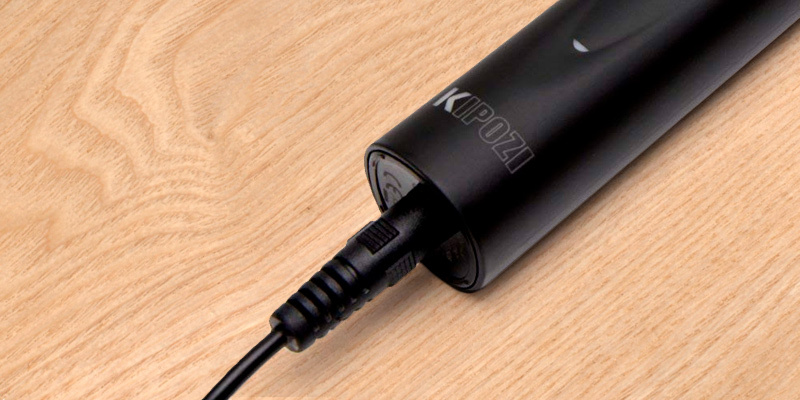 Right after delivery, it becomes obvious that the KIPOZI sonic brush is a fantastic value. Other things that add appeal to this brush include its waterproof properties and extensive battery life. The brush is IPX7 rated and can be used in a shower. The only thing to bear in mind is that you'll need to swing away the water in the charging hole if you decide to charge the brush right after your bathing session. It needs 4 hours to get fully charged and then it will work for 1+ month. Let us say, you really can't beat the price! This is a really a great option to accustom yourself and your family to ultrasonic technology. 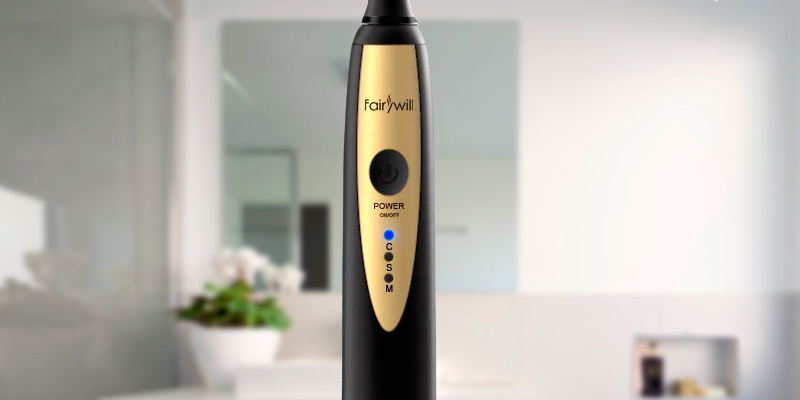 Fairywill is a Chinese company that has quickly become one of the most popular manufacturers of electric toothbrushes on Amazon. The features and the price Fairywill offers are extremely favorable. You really get quite a lot for your money. The FW-2081 BLACK is affordable, simple, nice-looking, and great to use. The powerful magnetic suspension motor offers a sonic technology with a maximum of 40,000 strokes per minute. The maximum power is especially felt on the Clean mode, while Sensitive mode has movements of approximately 30,000 per minute. The Massage setting offers even milder vibration. As we have already touched on the topic of available settings, you can select the needed one before powering on the brush. That's a handy option rarely found in more expensive models. The control panel features the buttons for all cleaning modes with an LED above each. For your convenience, the LED shines blue to let you see what mode you are using. The charging stand included in the package is one of the tiniest we have ever seen. And unlike most other stands that have a power cable with a plug, this one has a simple USB connector on the end of the cable with no power adapter. However, that's not a big deal considering that most people have phone chargers with compatible slots. Bear in mind that this type of charger might pose a potential safety risk and it's better not to charge the brush in a bathroom. But while this charging stand is not ideal for a bathroom, it gives you more flexibility in use whilst traveling. It offers a convenient way to use internationally as it accepts the connectors of many popular smartphones and can be plugged into your laptop. All things considered, this is a good toothbrush, especially for its price. It offers basic options and a flexible way of charging. It can become a good travel replacement for your advanced home brush. What Is an Ultrasonic Toothbrush? 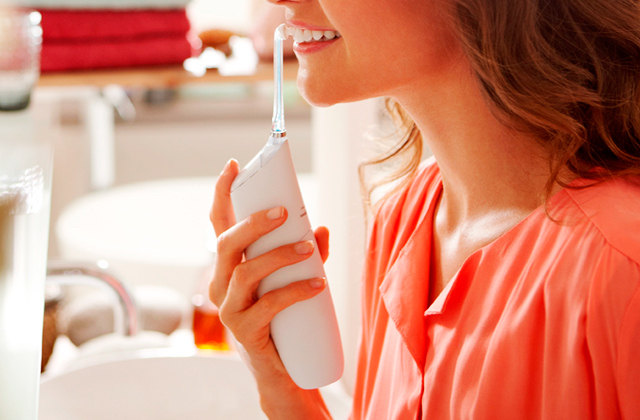 Ultrasonic toothbrushes are relatively new in the world of oral care technology. Nevertheless, they have been rapidly gaining popularity, and not without a reason. Ultrasonic toothbrushes are superior to electric toothbrushes in many ways, let alone manual models. 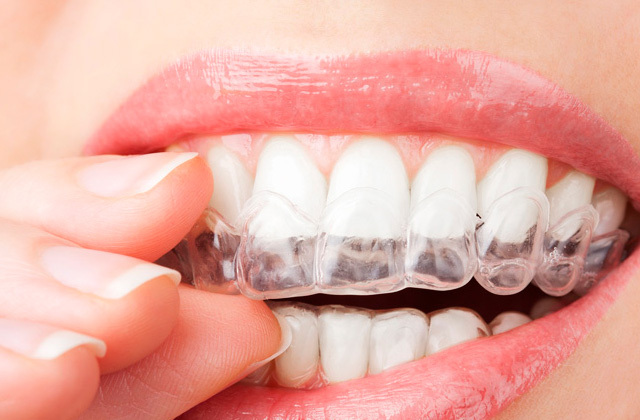 They emit ultrasonic waves at extremely high frequencies of approximately 192,000,000 vibrations per minute that can easily break up the chains of bacteria and dental plaque which usually form on the teeth and beneath the gums. Unlike any other type of brushes, an ultrasonic toothbrush can penetrate up to 2 inches beneath the gums for deep-cleaning. That's because it also cleans those areas where the bristles don't touch. Therefore, it offers a great way to fight gingivitis and gum disease since it can reach every place you may miss with a manual toothbrush. Compared to other brushes, ultrasonic ones are much easier to use. They don't require physical effort as their waves alone penetrate deep into the gums. And naturally, bleeding and soreness will become a thing of the past. So, we see no reason why not to give this special type of brush a shot. 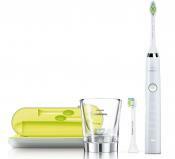 For this review, we have selected the best ultrasonic toothbrushes for any budget and any need. 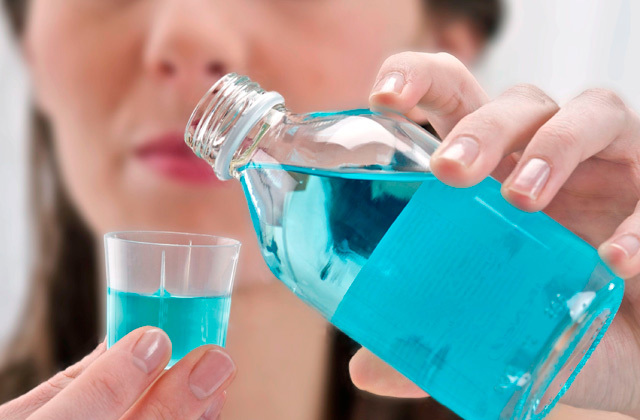 And if you're really serious about your oral health, we also recommend that you consider our selection of the best water flossers, whitening toothpastes, and mouthwashes. Choosing an ultrasonic toothbrush isn't that much different from selecting an ordinary electric toothbrush. Likewise, the first thing to consider is the performance. As we are considering only sonic and ultrasonic models, their performance may vary from 40,000 to 50,000 vibrations (strokes) per minute. Naturally, all ultrasonic toothbrushes can remove up much more plaque compared to ordinary manual brushes, but the most powerful ultrasonic brushes can cope even with tough stains from wine, coffee, tea, etc. 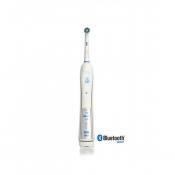 There're many models that are featured with gentle cleaning settings for sensitive gums. Some brushes have only a couple of cleaning modes, while others have multiple settings. Usually, high-end ultrasonic toothbrushes allow you to switch between gum massage mode, whitening mode, polishing mode, and intensive mode. It's up to you to go for a brush with simple and straightforward functionality or choose a newfangled model. Today almost all sonic toothbrushes are fitted with powerful batteries that can hold a charge from two weeks up to one month. Some of brushes come with stylish charging stations that double as stands, while others have built-in USB slots and require just a power cord. That said, if you often go to other countries, the latter option may be a better choice. You won't be tied to the power outlet during your travels and will be able to charge a brush right from your laptop. If you're a frequent traveler, an added travel case would be a nice addition to a brush. Hard-shell cases enable you to store the brush inside your luggage safely. Yet, not all models come with additional pouches, especially if they are on the budget side. In this case, consider models that are supplied with protective caps at least. Also, look at the extra features that contribute to the convenience of use. Consider the form factor and the weight of the brush to make sure it will be comfortable in your hand and you'll be able to reach every area of your mouth. If you have braces or veneers, pay attention to models that come with additional heads for orthodontics. 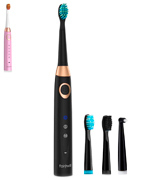 It is seemingly unbelievable that electric toothbrushes have been around for many years now. In 1927, the very first mass-market electric toothbrush was manufactured by the Electro Massage Tooth Brush Company in the US. 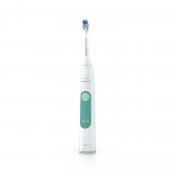 Later on, the General Electric (GE) company managed to improve the motor-powered brushes and introduced the first rechargeable, cordless toothbrush to the mass market. Since 1961, people no longer had to be attached to the power outlets. Still, it was rather bulky and heavy because it used NiCad batteries as a power source. 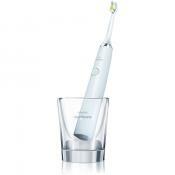 The first ultrasonic toothbrush was called the Ultima (or the Ultrasonex later). It was patented in the US in 1992. In the same year, it was approved by the FDA for home use. Originally, the Ultima toothbrush worked only by using the ultrasound but after a while, engineers of Sonex Corporation equipped it with a motor to empower it with additional sonic vibrations. Electric rotating-oscillating toothbrushes use a back-and-forth rotating motion to clean your teeth without putting too much pressure on your teeth. They can be as fast as 2,500- 8,000 strokes per minute. Compared to manual brushes with only 300 strokes, they are much more effective. Still, they are not as quick as sonic models. Sonic toothbrushes are claimed to deliver up to 40,000 vibrations per minute. 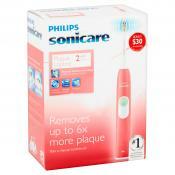 Extra-fast sonic brushes provide a very thorough cleaning and reach into hard-to-get areas of your mouth. Sonic vibrations can move fluids into such tricky areas of your mouth as in-between the teeth and along the gum line. Which one is better is still a debatable question. While some consider rotating-oscillating brushes more effective at scrubbing the plaque off teeth, others believe that sonic toothbrushes clean better because of their high level of vibrations. What Is the Difference Between Sonic and Ultrasonic? Many people mistakenly believe that sonic and ultrasonic brushes are the same. But in reality, they differ in the technology used and in performance. Sonic brushes basically offer from 12,000 to 40,000 oscillations per minute in the audible range. 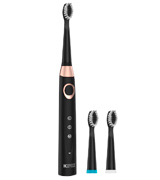 The movement they provide is higher in amplitude compared to ultrasonic brushes. Sonic brushes easily remove food particles and bacteria that lurk on your teeth and along the gumline. Ultrasonic brushes employ a much higher frequency and are effective due to the ultrasound rather than the motion of a brush head. Simply put, they don’t rely on physical motion. 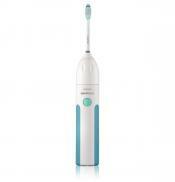 Ultrasonic brushes emit vibrations of 20,000Hz to remove plaque, stains, and bacteria. This high-frequency wave works as far as 2 inches below the gumline, providing a deep and thorough cleaning.